Edward Bretland was born on July 23rd 1897 to Edward Coke Bretland (senior) and his second wife Rose Annie (née Smith), who he had married in 1896. 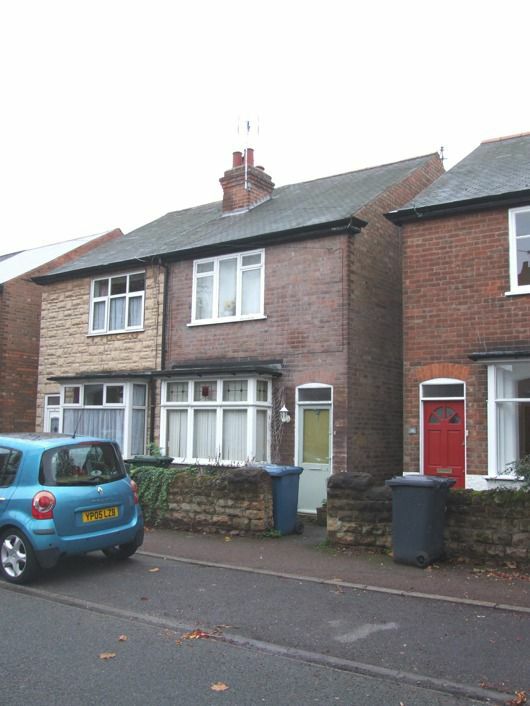 They were living at 38 Portland Road, West Bridgford, which is a district of Nottingham. Edward and Rose only had one other child together, Douglas (b c1906), and obviously he was a full sibling to Edward, but there were also four half siblings from his father's previous marriage to Louisa Fann; they were Reginald (b 1884), Louisa (b 1886), Gladys (b 1891) and Marion (b 1895) – Louisa died during Marion's birth. Incidentally, Louisa (the daughter) married Charles Wild hence the Wild's family connection to Edward and in fact he is a half great uncle to Gina, Lynda and Jonty. 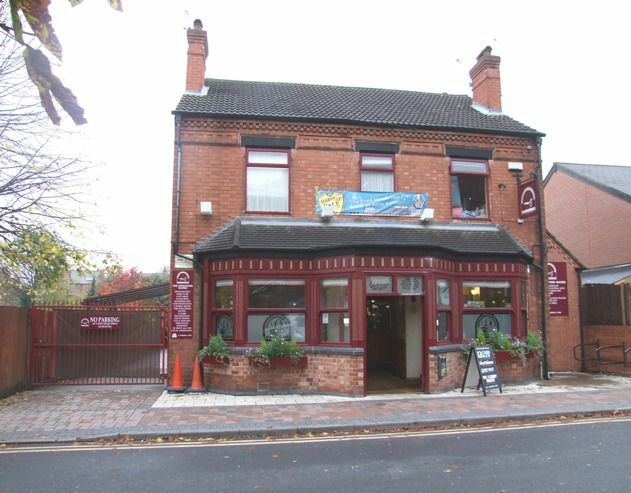 The 1901 census shows all the family, except Douglas, who had not yet been born, living at 2 Stratford Road, West Bridgford - now the Stratford Haven public house. They seem to have been fairly comfortably off, appear to have been moving up in the world and probably considered middle class. The census lists Edward senior as a lace manufacturer and an employer; Reginald was a clerk in a lace warehouse and Louisa a lace pattern girl, probably both in their father's business. The family also employed Annie G Martin as a general servant. 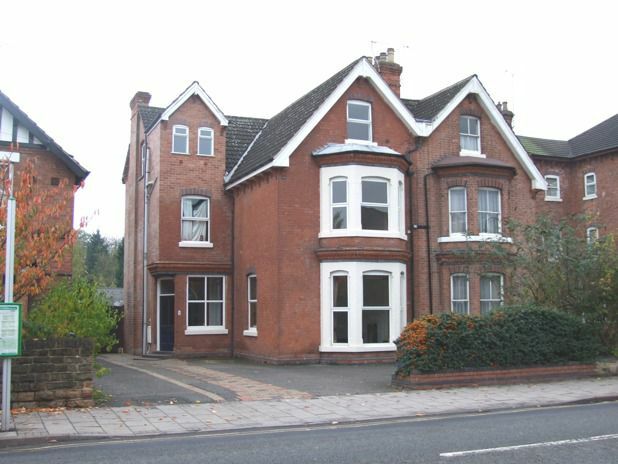 By 1911 the family had moved to 5 Bridgford Road, West Bridgford – not far from the Trent Bridge cricket ground and only 350 yards from their previous house. Edward was then 13 and at school. 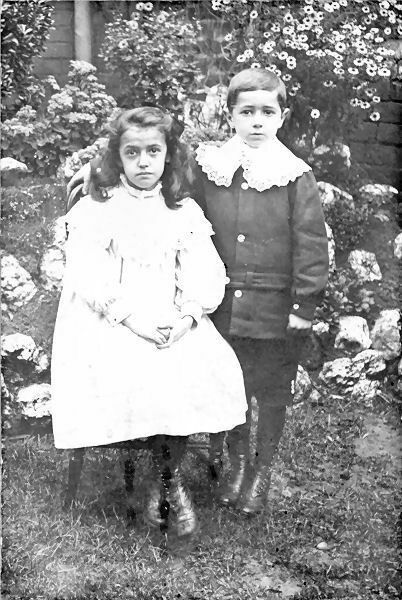 The photograph of him and his sister Marion, appearing here, was probably taken between these two census years. The family lived at this address until the 1920s, at some point adding the name Bridgford House to the address. As often experienced when researching World War One soldiers, there is a mixture of fortune; unfortunately the research of Edward's military service is hampered by the fact that his war service records were amongst those destroyed by bombing during World War Two, but helped by the fact that the Commonwealth War Grave Commission's Debt of Honour Register confirms that his was a unique name amongst the war dead. 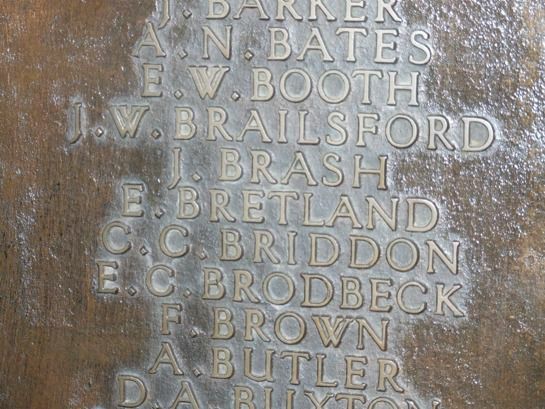 The latter means that we can be confident that the E Bretland appearing on the Mundella School War Memorial in St Mary's Church, Nottingham (originally it was in the school), is our Edward and that Mundella must have been the school he attended. His name is one amongst 122 Old Boys from the school who gave their lives. When war was declared he was just seventeen. As his war service records no longer exist we do not know when he enlisted or when he started to serve and without that information his experience could be assumed to be the same as his Battalion’s. Ordinarily that would be a reasonable assumption, but in Edward’s case it is more complicated because the Sherwood Foresters' records*¹ record him to be a signaller. That would mean he had specialist duties and, while the 17th Sherwoods war diary describes the Battalion’s experience, and his would have been closely aligned, his duties would have often kept him away from routine duties and away from some of the dangers of the trenches. This should be remembered when reading what follows. 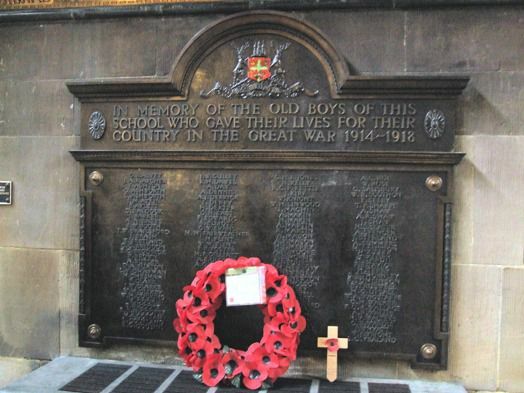 The 17th was a service battalion within the Nottinghamshire and Derbyshire Regiment and was formed in June 1915 by the Nottingham Mayor and the Recruiting Committee. They were also known as the Sherwood Foresters and the Welbeck Rangers - presumably the latter due to the proximity of Welbeck to Nottingham, although there may have been other reasons as well. A service battalion was one formed from new recruits who enlisted to serve for the duration of the war, as opposed to the 'regular' battalions of the British Army. The normal length of training was six months, so the men who joined when they formed would not have been ready to fight until 1916 and indeed the Battalion did not go to France until March 1916. 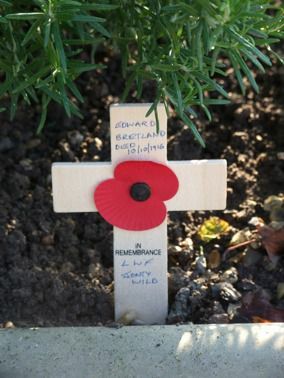 As Edward was in France with his Battalion in 1916, when he was killed, it seems likely that he joined when the Battalion was formed or very soon afterwards and he would have started his training within a few weeks of enlisting. 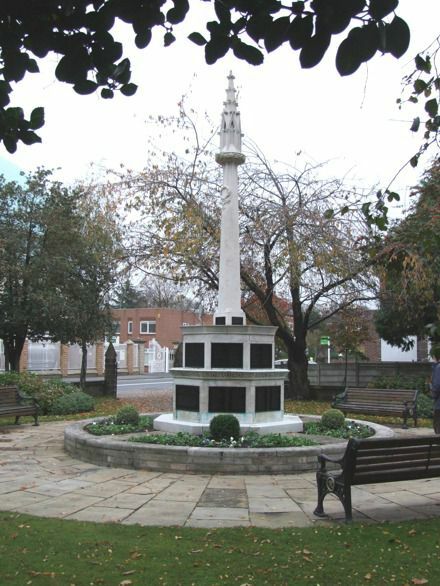 In October 1915 the Battalion moved to Aldershot, presumably after being based somewhere local to Nottingham, and were attached to 117th Brigade in the 39?th Division. Then in November 1915, they moved again, this time to Witley Camp - a temporary army camp on Witley Common, Surrey. All of this time would have been spent training and in preparation to turn them into a full fighting battalion. It would have been during training that Edward would have been identified as suitable for signaller training and must have shown intelligence and an aptitude for the skills required. He would have been trained to use all the signalling tools; flags, lights, Morse code and in the use of the standard field telephone which would be used for communicating with the front line. Part of his future duties would be the laying and repair of telephone lines and in war that would often be in very dangerous situations and a lot of responsibility for such a young man. If Edward was with the Battalion when they left for France, which I think very likely, he would still have been eighteen and in theory the rule was that no man under nineteen should be sent overseas to fight - often that was 'conveniently' forgotten, but perhaps in Edward's case they considered that a signaller would not necessarily be in the front line or 'fighting'. The Battalion war diary starts on March 6th 1916 as they prepared to leave Witley Camp, for France. The Battalion boarded three trains at Milford Station, travelled to Southampton and then embarked on three ships; the Archangel, the Inventor and the Connaught; arriving in Le Havre at 7am on the 7th. They went through a short period of inspections, parades, training and route marches, moving through France from Bleville to Steenbecque then Estaires, Sailly, Busnettes and reached Bethune on April 6th. It was during this period, on March 24th, that they suffered their first casualties with one man killed and two wounded "during instruction". Their first taste of the trenches came on April 7th when 'A' and 'B' Companies moved into the trenches at Annequin; they were under the instruction of the 20th Royal Fusiliers, but held their own trench. The next day 'C' and 'D' Companies relieved them and the companies not in the line formed working parties. A brief baptism to the Front, but nevertheless three other ranks were wounded. After another day in which they formed working parties, the Battalion moved back to the trenches at 'Auchy Right' where they stayed for four days. This was near the Hohenzollern Redoubt, which had been the site of fierce fighting in the autumn of 1915. Their war diary describes the experience as "Trench routine work. Situation normal", but also reports two mines exploded nearby, a bombardment and confirm 3 other ranks killed and 10 wounded, although 3 of those remained on duty. There then followed a period out of the trenches, but not out of danger, as the formed working parties and casualties continued to slowly mount. All were other ranks, 3 killed and 3 wounded on the 19th and 1 killed and 1 wounded the next day. Good Friday was spent out of the front line; at the Devine Service, bathing and they had a welcome change of "underlinen". They moved to Le Touret, Festubert section trench and while in the trenches, the much feared gas warning was called for the first time (for the Battalion), but the gas and subsequent bombardment came to their right, so they were not affected. The British artillery reply was recorded as lasting an hour. At around this time a confidential report was written on the 17th Sherwoods. It was fairly complementary, but registers some concerns. Of the men, it records "The men are good material and should make good soldiers. They work hard and cheerfully. They are not quick to act on orders but this is probably due to the fact that they are slow thinkers." Of the officers it notes "The Officers are keen and with more experience should do well. Some do not seem to be able to get all the work possible out of the men, due to their inability to exercise their powers of command fully at present." In summing up, it concludes "The general impression which the Battalion made is a favourable one ... A certain number of the men are quite young, but they are a good type and should improve rapidly." One cannot but wonder what the Battalion made of those doing the reporting. The entries for May begin by recording that they were relieved by the 16th Rifle Brigade and recording their casualties for the previous four days as just 2 other ranks wounded. Most of May was spent out of the trenches training or forming large working parties of up to 350 men, who worked in the front line at night, probably carrying supplies, maintaining trenches or laying barbed wire. They also changed position, moving from Festubert to Hingette, then to Gorre and then to Givenchy. They spent time in the trenches at each location; separate periods totalling twelve days, ending the month in the trenches at Givenchy. Casualty numbers for May are a little unclear, but the diary, seems to record 33 other ranks wounded, 11 killed and 1 officer wounded. These were suffered while providing working parties and while in the trenches, so even in this 'quiet' period casualties were increasing. Their trench duty at the end of May continued until June 3th when they were again relieved by the 16th Rifle Brigade. They then marched back to Gorre, where they had some rest, bathed and changed their underclothes. By this stage of the war the men would have been dirty and usually, living in their clothes for days or weeks on end. It is very likely that all the men were infested with lice, also known as chats. These were maddening, itching creatures and impossible to get rid of in the front line. The relief received from bathing and new clean clothes generally did not last long. A popular pastime in the quieter times in and out of the trenches was sitting in groups chatting – killing the lice and their eggs, often by running candle flames along the seams of clothing where the lice hid and laid eggs - while talking to their pals. On the 6th they moved to billets at Ferme du Roi, for "Routine, General clean up. Inspections". Then, on the 11th they moved into the trenches at Festubert for a lengthy period of thirty-four days. This meant that the Battalion was in the trenches until July 14th, although it was not quite as bad it sounds because the men's trench duty was not constant, the length of trench they held meant that for the most part the Battalion companies could interchange to provide time away from the front line. For most of this period the war diary uses a standard phrase "situation normal" and that fails to describe the experience, a simple way to convey more is to look at the casualty numbers; casualties for June were 1 officer wounded, 44 other ranks wounded and 14 killed and for July: 1 officer killed, 8 wounded, 129 other ranks wounded or missing and 35 killed. Perhaps even with these levels of casualties the Sherwoods could still be described as lucky - lucky because they missed the devastation of the preparation for, and the catastrophe of the beginning of the Battle of the Somme. Despite being some 50 miles away they would have heard some of it. In the seven days before the battle the British artillery fired 1,750,000 shells (250,000 a day for 7 days). It was supposed to cut the enemy’s barbed wire defences and destroy the Germans' will to fight. It did neither and on July 1st 1916, 120,000 men of the British Army advanced at walking pace; by the end of the day there were 57,470 British casualties, including 19,240 dead, a casualty rate of 48%. There are more detailed descriptions of some of events experienced by the Sherwoods; the diary makes little drama of it, but does mention the British bombardment of the enemy on June 26th and more interestingly the details of a trench raid on July 3th. On that night, a small party of two officers and forty-eight men raided the German trenches. Their objective was to attack the German front line over a length of about sixty yards, to do as much damage as possible and remain for about fifteen minutes before returning to no-man's land to guard the flank of another raid. The raid was considered 'most successful' - 1 officer was wounded, 1 man killed, 1 man missing, 5 non-commissioned officers were wounded and 6 men wounded, just a 29% casualty rate. They left the trenches on July 14th and for the rest of July were, for the most part, back to the old routine of forming working parties, working around Richebourg St-Vaast, Les Choquaux and Givenchy. 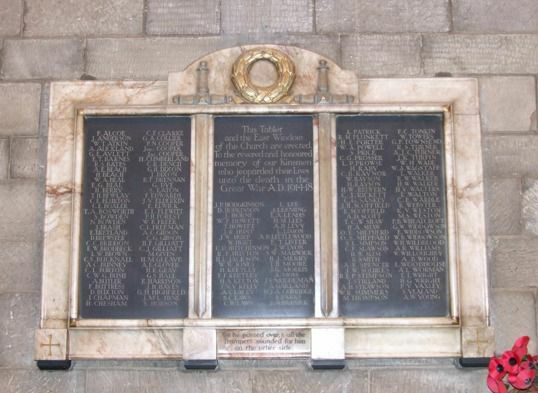 The exception was a small raid on the night of the 19th with one officer and 18 other ranks. The object of that raid was to capture a prisoner 'at all costs'. They were to lay up in no-man's land, entice a German Patrol to come out – it does not mention how. They were nearly successful, a German patrol did come out from their lines, but became suspicious, returned and started throwing bombs and released rapid rifle fire. This wounded the officer in charge, 4 others and a NCO was missing believed killed. They withdrew back to the British line getting back at 12:30am 1¾ hours after they had left. 1. To raid the German trench. 2. Capture as many prisoners as possible. 4. Destroy two mine shafts. This was a serious business and casualties were expected, so the party included eight stretcher bearers. They were to assemble in no-man's land and advance under cover of a British artillery barrage. It was not a good start, as three men were hit by British shells. Today we call it friendly fire – I am not sure the men would have used that expression. They got to the German wire in front of the trenches and came under very heavy machine gun and rifle fire, but still managed to get through and bombed several dug-outs. They also captured four Germans, but they were lost when the Germans counter-attacked with bombs. At one point an unofficial order to withdraw was heard and some men started back, this was quickly countermanded and they bravely returned to re-enter the trench at a different point. Of the 137 men 68 became casualties including 5 killed, 51 wounded and 12 missing. No prisoners were brought back, not many Germans appear to have been killed during the raid and the one mine shaft found had already been destroyed by a shell. The official report concludes that "It cannot be claimed that the objects of the raid were entirely achieved". This was the Battalion's experience thus far, but what of Edward's? One specific event for Edward was on July 23th - his nineteenth birthday. We do not know how he celebrated, but he was out of the front line, somewhere around Richebourg St Vaast and for that day the war diary records "Routine, Working Parties, Bathing", so he was lucky enough to be away from the front line and perhaps luckier still had the opportunity to bathe and change his clothes. In more general terms it is unlikely that he would have had the experience of normal trench duties, probably no digging or maintaining the trenches, no defending the trenches or night time trench duty, no watching for enemy movements or attacks and he would not have been among the soldiers making direct raids or attacks with guns and bombs, but many of his mates would have been. It is much more likely that his experience related to establishing communications and undertaking those communications to or from the front lines. He was less at risk of encountering an enemy soldier, but at high risk from shells. He may have been with, but perhaps slightly behind, some raids or attacks – the raid overnight on July 31th included four telephonists so it is possible that he was present. Also as a signaller he could have been called upon to repair telephone lines which were often cut by shell blasts. These would usually be between or behind the British trenches. In these situations he would often be isolated, on his own or with just one or two men. They would be in great danger from shelling and enemy snipers. It is probably fair to say that there were times when Edward would have been in worse danger than the men in the trenches. For August the Sherwoods were in the trenches until relieved on the 6th – another 20 casualties including 6 killed, and then helped clear up the aftermath of a heavy enemy bombardment on Bethune. On the 9th they were inspected by Major General G J Cuthbert C.B. C.M.G, Commander of the 39th Division, he congratulated them on their turn out and on their raid of July 31th. He declared that "it was the most successful raid carried out by any one Battalion since the Division's stay in France". This raid is described above and, as one presumes he had read the reports, so this must surely have been intended to boost moral. 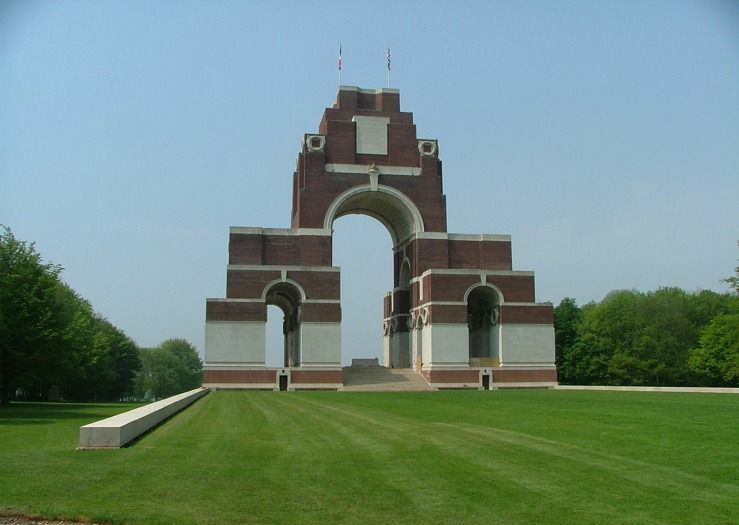 On the 10th they marched twelve miles from Essars to Auchel and on the 11th to La Thieuluye, another eleven miles – three men were too fatigued to make it. For the rest of August they trained, normally from 9am to 3pm. On September 1st they were due to move to Vitermont, but that was cancelled and on the 2nd the war diary declares: "Battalion now ready to take part in the 2nd Offensive on the Somme" and they moved into the trenches; 1,500 yards due south of Beaumont-Hamel, 1,000 yards due north of Hamel and 3,000 yards north-west of Thiepval. Perhaps the men found the prospect of the forthcoming battle exciting, but knowing what had happened there just two months earlier it must have also put the fear of God into most of them. The Battalion's strength should have been around 1,000 men, but after all the previous losses the 17th Sherwoods strength was recorded as 19 officers, 1 medical officer and 650 other ranks. They received a draft of 1 officer and 16 men giving them a total of 687 men. At 5:10am on September 3rd, they moved in preparation for an attack which would commence at 6am and which would be a major tragedy for the Sherwoods. The Operational Order No. 19 gives the objectives of 'A', 'B' and 'C' Companies as to 'attack the German Front Line'. 'D' Company was to protect the flank. The attack was to follow the British artillery's creeping barrage, with companies attacking in waves passing through each other by about fifty paces. Two particularly interesting items appear in the orders; in respect of movement, "no movement contrary to the arrows""will be allowed from half an hour before zero except Runners … All other stragglers will be turned into GORDON AND ROBERTS TRENCHES, where they will be collected by Officers of the 17th K.R.R. Corps (Kings Royal Rifles Corps) and forwarded to the German Trenches. Traffic Control Posts will shoot any straggler disobeying these orders." Under 'COMMUNICATION' is something that might have affected Edward: "The Battalion Headquarters will be connected with the Brigade by unburied cable." Two lines were to be carried forward by the Battalion and laid as they advanced. It helpfully notes "These lines will be liable to break down" (probably meaning cut by shelling or damaged by other advancing troops). It also presumably meant that it would be somebody's job to fix them – Edward's? It also mentions that if these were to fail "every effort will be made to establish Visual by flag, or disc, shutter or lamp." - a signaller’s job, probably standing, certainly exposed, in the middle of an attack trying to signal back to the British lines. We do not know Edward's part in this, but he was almost certainly present. He may have been laying the lines or waiting to fix them or with the troops to send signals back. Whichever, it would have involved running through mud - it was raining - though a shell-cratered landscape, over dead bodies and ignoring the cries for help from the wounded, all the while dodging, as best he could, craters, bullets, shells, shrapnel and flying detritus. 'A' Company seemed to have had amazing success, occupying the German first line by 6:10am, but reported the second line was strongly held with machine guns. They were also reporting very heavy casualties and that reinforcements were already urgently needed. Two companies of reinforcements from the K.R.R. Corps reached them at 7:15am, but the German defence was strong and casualties high. At 2pm orders were given to withdraw and that withdrawal continued until sometime after 7:30pm. The casualty count was horrific: of the officers, 6 were killed, 7 wounded, 1 was missing and 2 wounded and missing. Of the other ranks: 59 killed, 158 wounded and a staggering 221 were missing. Of the 687 men they had, 454 became casualties, which is over 66% - it was disaster! The war diary later recorded that Brigadier General R D F Oldman "sympathises with them" (the 17th Sherwoods) "in the loss of their comrades and compliments them on their fighting spirit, shown on the 3rd Sept and their devotion to duty." He further maintains though unclearly written that "their sacrifice was not in vain." Although they received a draft of seventy men, they would normally have been withdrawn from the front line, but such were the losses elsewhere that they were back in the trenches on September 12th and did not leave again until the 30th. October started quietly out of the trenches and in Bertrancourt and then Hedauville. On the 5th they relieved the 6th Royal Berkshire Regiment in the Thiepval Sector manning the trenches and providing support. The war diary records heavy bombardment by both sides on the 6th and 7th. On the 8th the Germans attacked the left flank with bombs (hand grenades) and the Sherwood's bombing post using flammenwerfer (flamethrowers), while firing a heavy barrage on the front support and reserve lines. The Sherwoods bombing post was driven out, but their counterattack captured 13 Germans and killed 25 more. They noted the Germans were from the 110th Regiment of Baden-Baden (probably the 10th Baden Grenadier Regiment). On the 9th at 4:30am a platoon (approximately 30 to 50 men) took part in an attack on the infamous Schwaben Redoubt in conjunction with 16th Sherwood Foresters. They secured their objective: "with a great dash and gallantry our men accounted for a considerable number of the enemy." They stayed for over an hour, but the troops on their left flank failed to achieve their objective, as a result, and with the Germans counter-attacking in force, they were forced to withdraw. The war diary reads "It was a splendid fight and good leadership was shown by the officer in Command." October 10th 1916 is officially recorded as the date of Edward Bretland's death. The war diary records that on the 10th there were intermittent bombardments and that the Sherwoods were relieved by the 1st Herts. It does not specifically mention casualties on that day, but if there were any they are included in the numbers given for the 'last five days'; 1 officer wounded, 29 other ranks killed, 72 other ranks wounded, 1 other rank missing and 2 other ranks wounded, but remaining at duty. As Edward's body was never found, the obvious conclusion would seem to be that Edward was the missing man, however it is not that simple. The local papers were investigated at the British Library; and although, sadly, no photograph of Edward was found, three snippets of information were; two newspapers, the Nottingham Daily Express and the Nottingham Guardian record, under "last night's list, Bretland 30988 E (Nottm)", as wounded. Both of these papers are dated October 9th, the day before the date recorded for his death. It is possible that Edward was wounded on the 8th and did die on the 10th, but what is unlikely is that the news of his being wounded would have reached the local papers so quickly. It was common for such news to take weeks to reach home and the newspapers, but perhaps Edward had friends in the right place to be able to telegram the news to England. Whatever the case it must be true that the events that led to his death were certainly before the 10th. Having received the news, and seen the papers, which on the 9th alone listed 356 casualties amongst the Sherwoods (all Battalions), Edward's family must have been greatly relieved and very happy that he was alive. Sadly that was short lived, they received the news, which was reported in the Nottingham Evening News on the 17th, "News has been received by Mr. E. C. Bretland, Bridgford House, West Bridgford, a well-known Nottingham lace manufacturer, of the death in action of his second son, Signaller Edward Bretland." 1. He was indeed wounded around the October 8th and did die on the 10th and his grave subsequently lost. 2. He was misreported as wounded and his body was just lost and, given the length of time it would normally take for such news to reach England and the papers, this could have been days or even weeks before October 10th. 3. He is buried, but in a grave marked as 'Known Unto God'. Perhaps the exact date is unimportant; he died, and he died tragically at only nineteen and the 10th is as good as any other date to acknowledge his death. 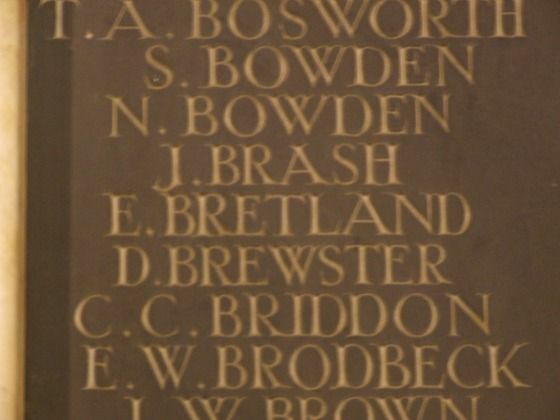 Private 30988 Edward Bretland may not have a grave, but his name is not forgotten. 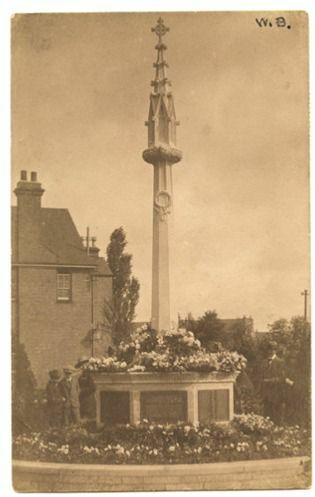 In West Bridgford, it appears on the Mundella School War Memorial in St Mary’s Church, Nottingham – on a bronze plaque listing 122 'Old Boys', from the school who died; on another bronze plaque to the West Bridgford fallen in St Giles' Church, which lists 168 names; and on the West Bridgford War Memorial sited on the junction of Musters Road and Bridgford Road, which records 190 names from the First World War. He is also remembered in the family grave in Nottingham General Cemetery (grave number 20292). The grave contains Edward (senior), his wives, Louisa and Rose, and to their inscription another is added for Edward: "Edward Bretland Private 17th Sherwood Foresters, killed in France". 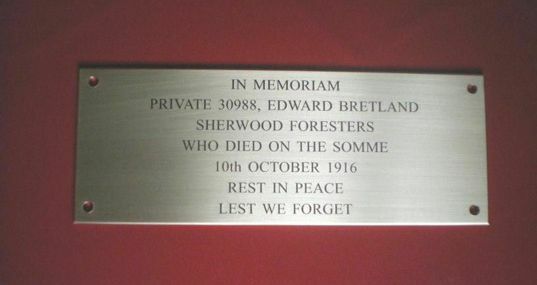 140,000 men served in the Sherwood Foresters during the Great War, 11,409 of them died, including Edward. 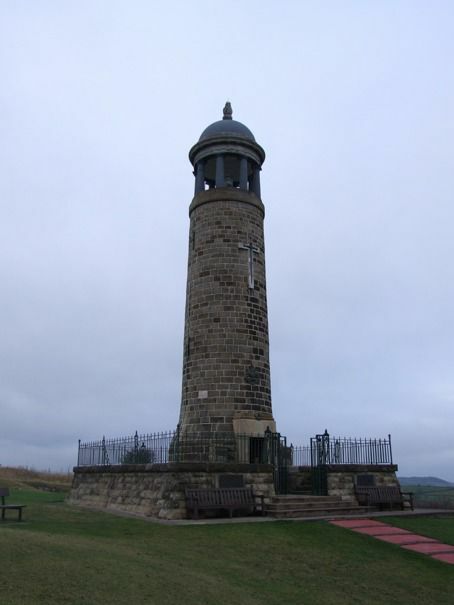 They are remembered on a number of memorials, but the Regimental Monument is the Tower and Grounds on the summit of Crich Hill, near Crich, Derbyshire and it is well worth a visit. Creeping Barrage: a moving line of artillery fire, intended to stay just ahead of the attacking force and act as a protective curtain by forcing the enemy to take cover. Mine shafts: both sides dug mines towards and under the other side’s trenches, if successful they packed the end with explosives and blew them up with devastating effect. Redoubt: a fortified and heavily defended stronghold. Jonty Wild is the great nephew of Edward Bretland. If you have any questions or comments about the information on this site in general, or you have further information regarding this article, please get in touch with us by email: Jonty. We look forward to hearing from you.